Today I saw titles about geese terrorizing gardeners, gamers helping find medical cures, and PVP in a post-Ragnarok Norse world. It’s been an amazing show, and I can’t wait to dive deeper into some of these titles in the coming weeks. As usual, let’s start out with the incredible indie titles. It’s been over a year since the first time I saw Rend and the game has changed a lot in that time. 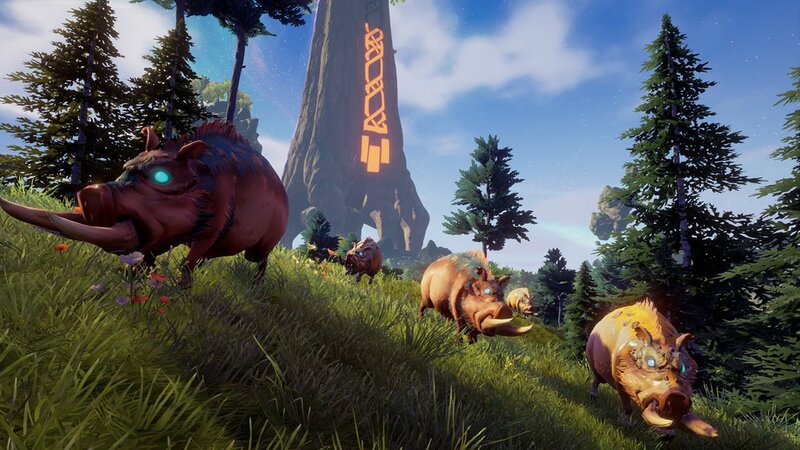 For those who are unfamiliar, Rend is a multi-faction survival game set in a fragment of a Norse world after Ragnarok (end times) has taken place. Players spawn into a vibrant world filled with mythical beasts, stunning environments, and of course, other hostile players. The game has three factions and players will consistently level with their faction throughout each game and gain rewards based on their contributions. Matches take place in a persistent world for around a month (shorter if the win condition is reached) at which point the server resets and the world begins anew. Players are rewarded for their participation through perks that persist between resets, giving them a leg up for the next go around. During our conversation at PAX, we discussed a host of new features coming to the game, but they are under embargo until later this week. So, stay tuned to Gizorama and keep an eye out for our piece detailing all of the new features coming to the game soon. In the meantime, Rend is now in early access on Steam! When I walked in for my conversation with the leaders of Balanced Media Technology (BMT), I was more than a little skeptical. The pitch was essentially this: Use the power of games to help solve real-world problems with the human mind’s uncanny pattern recognition abilities to help machine learning algorithms run faster. In addition to the human element, users can also opt in and donate some of their unused CPU power to help their favorite causes, creating a nationwide, distributed, supercomputer. Using their platform, HEWMEN, BMT has created an interface where users can go in, play a classic game like Q-Bert and help scientists at the same time. I’ll have a more detailed write-up coming later this week (there’s a lot of complexity from our interview to sift through), but suffice it to say, the technology is promising. More to come soon, but in the meantime, check out BMT Games’ website here. Ever wanted to terrorize a farmer, honk your way through a local market, or just wreak general avian havoc? 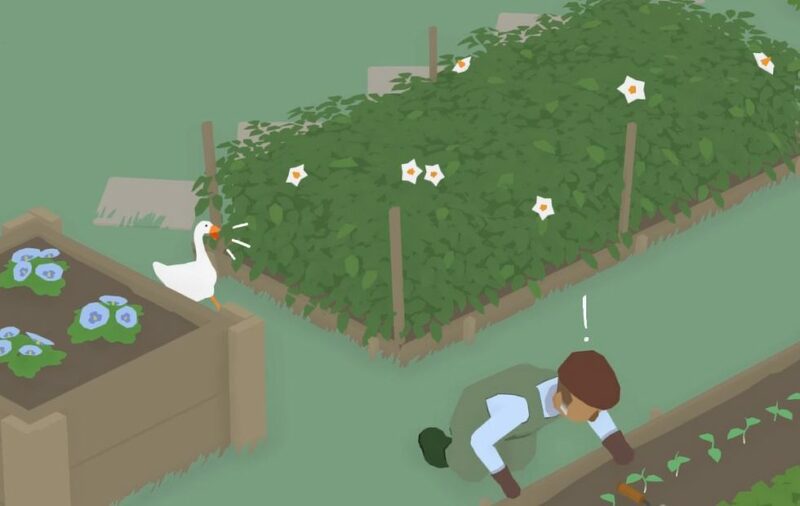 Untitled Goose Game might be the title for you! Releasing in 2019 on Nintendo Switch and PC, Untitled Goose Game allows players to step into the webbed feet of a goose hell-bent on ruining just about everyone’s day. The game employs tactics of stealth, distraction, and unfettered honking. I had a chance to speak with the lead developer and ask the important questions like: ‘Why geese?’ and ‘No, really, why geese?’ They simply responded ‘Geese are just funny’. After a brief hands-on demo with the game, I cannot help but agree. In my short time with the game, I was tasked with terrorizing a groundskeeper by throwing his rake in the lake, stealing his radio, and just causing general hell. The tasks themselves are not complex, but the strategies that need to be employed to complete them can be. The developers said they realized about halfway through development that they were almost making a Metal Gear Solid game, with a heavy emphasis on sneaking around and causing destruction in plain sight. While I’m not sure how far that tracks, the game is no doubt fun and had me laughing out loud at the demo station. Dying Light 2 might still be a bit away, but that’s not stopping developer, Techland, from putting out new content. Dying Light: Bad Blood (DLBB) is the developer’s take on the battle royale genre, although they insist it be called ‘brutal royale’. Gameplay will be very familiar to fans of the original Dying Light game, with one important twist, the marauding scavengers are other players, and it’s a race to the finish. Each match starts with 12 players all vying to harvest infected blood and claim the one spot on an evac chopper. What sets DLBB apart is the PVE aspect, because those zombies the franchise is famous for, are still there. The mix of PVE and PVP elements led to fun, frantic matches that were over quickly and left me wanting to play more. 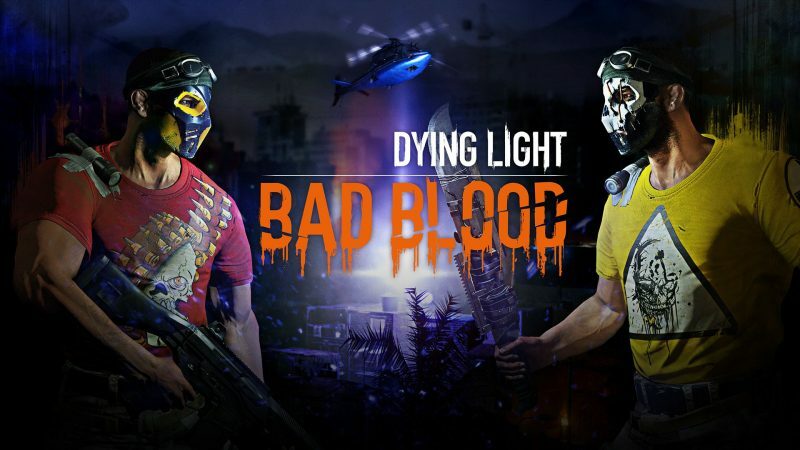 Dying Light: Bad Blood is available in early access on Steam right now, and it’s a hell of a lot of fun. Bandai Namco is taking on MMOs for a new platform, consoles. Bless Unleashed is a brand-new, free-to-play MMO designed from the ground up for console players. I was able to go hands-on with three of the game’s classes, and I have to say, it’s got some of the most satisfying combat I’ve ever seen in an MMO setting. Granted, I was playing alone in my demo, so I didn’t have a chance to see what it felt like with a horde of other players fighting at the same time, but in these early stages, it’s looking good. In my time with the game, I was able to see a series of cyclopean enemies that provided excellent fodder for testing the game’s combo system. Each class feels very distinct from one another and allows for interesting diversity in playstyles. At this time, there were three playable classes in the game taking the form of a ranged attacker, a berserker with a two-handed axe, and a defender wielding a shield-sword combo. My favorite was by far the defender, mostly because the look and feel reminded me of a crusader, but each of the character models looked great and handled well on console. While the demo didn’t give much of a look into the game’s story or overall narrative, I was assured that they will be a focus. Much like other MMOs, there will be a mainline quest for completion, sending players out across an expansive world to vanquish unique enemies and interact with each other. There are a lot of components that were hidden from the demo, but after my short time, I can say I’m intrigued. Bless Unleashed releases sometime next year, with a beta coming soon. Xbox One players will get their hands on it first, with a PS4 version coming later. No word on how long the lag time will be there. 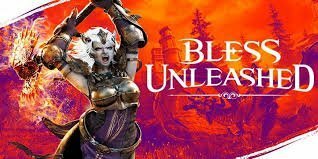 For more information on Bless Unleashed, check out their website, and keep checking back here as we’ll have more information as it gets closer to release. As usual, PAX West 2018 won me over with its incredible indie titles. My game of the show has to be My Friend Pedro, and I can’t wait to write about it more as it gets closer to release. For more info, check out our wrap-up from yesterday here where we featured My Friend Pedro as well as some other excellent indie titles.